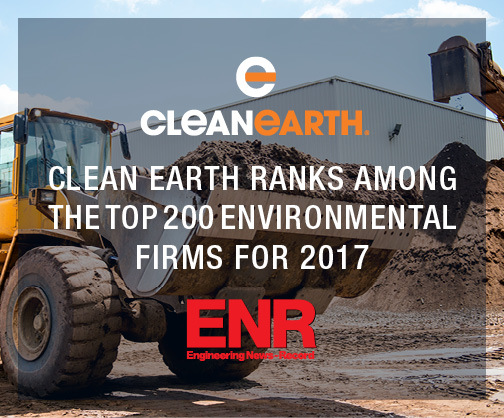 Clean Earth, Inc. a leader in disposal and recycling solutions for contaminated soil, dredged material, and hazardous and non-hazardous waste, announced today the company ranks impressively at # 54 on Engineering News Record’s Top 200 Environmental Firms of 2017. ENR’s comprehensive list and article provides expert insights on the future of our industry, economic growth, current trends and technologies. Since the last ENR Top List release in 2016, Clean Earth has expanded services into new waste streams and geographic locations. In April 2017, Clean Earth acquired AERC Recycling Solutions. AERC recycles electronic and universal waste with locations across the country. This acquisition continues to define and grow Clean Earth’s vision to provide recycling and beneficial reuse services for hard to recycle, specialty waste.